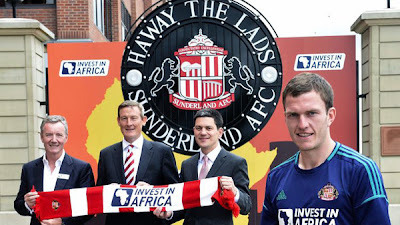 "...as founder of “Invest in Africa”, Tullow Oil has emblazoned the name of the campaign group on to TV screens in a sponsorship deal with Sunderland football club in northeast England [...] Aidan Heavey, Tullow’s chief executive, said: “At a stroke, this association will make Sunderland the most popular football club in Africa.” Mr Heavey’s claim will appear to many as quixotic. Yet it clearly reflects a desire by Tullow and its Irish founder to act as a cheerleader for investment, rather than aid, in the continent where the Chiswick-based company continues to concentrate its attention. [...] since its creation in 1985, Tullow’s main focus has been in Africa, where it now operates in 15 countries and claims to be the continent’s leading independent oil company. The stated aim of Mr Heavey’s campaign vehicle is to attract the support of other companies operating successfully in the region, challenge misconceptions about doing business on the continent and “tackle the gap between the perception and reality of doing business in Africa”. Tullow itself claims credit for encouraging local recruitment and training of senior management in the territories where it operates, as well as job creation and investment."